What is Display All Category Module? 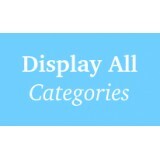 Display all categories module is an opencart extension helps you display all parent categories to your customers. You can easily display all categories in menu. You can also display all categories on any page like Home page, Category page, etc. Customer can easily find any parent category as he can see all categories without issue in menu or home page. Many times customer cannot find the category properly on site and they leave. With this, you will find increase in sales as customer will easily be able to find the category and hence the product. It will increase your click through rate which is good for SEO. - Show all categories link in menu. - When customer hover on image, it will get auto zoomed. - Category box are responsive, It works with all themes of opencart. 1) You can see all categories link in menu. 2) You can see [b[all categories module on home page[/b] below slideshow. Check link below. - No core files are changed. - Works with all themes. - Free installation is available. Check Extension Updates in Documentaion below. PDF Invoice Orders allows in generating / sending the PDF Invoice for your orders along with your default html email. The pdf invoice is designed nicely to get the best look for a pdf invoice. It contains all order details that an invoice should have. Extra details can also be added to Invoice. So customers are always satisfied with the invoice. Pdf invoice can also be seen from order list page for each order. - PDF invoice can be checked on both admin and customer side. - Admin can see pdf button on sales - order list page. - Customer can see pdf icon in order history page in my account section. - PDF invoice is also send in email to customer and admin when order is placed. - Option to allow PDF to be seen only for certain order status like : Complete, Shipped, Etc. - PDF invoice also supports special characters like latin, spanish, greek, hungarian, etc. - Option to add Tax details like VAT / TIN / ABN number in PDF Invoice. - Option to auto generate invoice number when order is placed. - Option to show product images in pdf invoice. - Option to create pdf invoice with store logo and without store logo. - Option to add extra rows in PDF for better invoice look. - Option to add custom messages in footer for better invoice look. - Option to show page number in Invoice for better invoice look. - PDF can be set in portrait or landscape mode. - Different font style available for pdf invoice. - Option to change the text size of pdf. - Option to change the width and height of PDF Invoice. See different sizes. You can check new column TAX INVOICE besides order total column. Works with all themes. No core files changed. 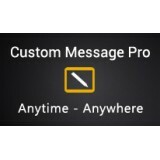 Custom message pro is an useful extension to display useful messages across store. Messages can be used for variety of purposes like alerts, warning, information or offer display. When such messages are displayed customer stays on your site for longer duration time, which decreases your bounce rate and improves ranking. It helps customers to know about site and easily navigate within your site. - Display custom messages at different locations on your store. - Messages can set for all the customers, selected customer group based or for a specific customer. - Messages can also be set only for logged in customers. - Messages can have date range period. In this period only they will appear. - Message can also be set for a life time. So they will be shown to customer always. - Messages also support links. It is useful to take customer to other pages of website. - Same message can be set at multiple locations at same time. - Message can be displayed to all users. - You can have your own background color and text color for a message. - Each message can have different font size, font weight and font style of display. - Support custom tags like customer name, email, telephone and order id. - Option to show or not show close button on message. Some message can never be closed. - You can add Html, images, icon in messages with rich text editor. - You can add messages in multiple languages. - You can set up messages on different stores. It supports multi store. - It supports multi language. - Messages are responsive. It is good for SEO. - Good reviews and good product support lifetime. How it is useful & Where it can be used ? Messages are like sign board on a road. It helps you reach the destination. Let your customers easily navigate to important section of store through messages. Displaying different coupon codes to users using messages. Displaying different coupon codes to different customer group. Also helpful in promotions. Show shipping message across store. Show new updates to customers or new information link about your store. We have set demo messages across the store for testing. - Added tags like customer name, customer email, customer telephone, order id. - Tags can be added in message and in front end tag value will be used. 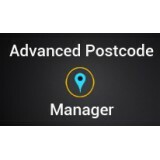 Advanced postcode manager gives you a complete set of tools to manage postcode in best possible ways. The extension is very flexible and we make sure that it will suit your requirements. We provide you with some outstanding features in one single module. - Postcode search box at your desired location. - Postcode check during account creation & checkout registration. - Postcode checking with popup when customer visits your store. - Setting up payment methods based on postcode. - Setting up shipping methods based on postcode. - Auto search for postcode when customer starts typing. - Special postcode search box on product page above add to cart button. - Awesome display of postcode results. - Tested with all browsers so that your traffic is not reduced. - Above features can be enabled / disabled as per requirements. You can add postcode search box at different locations. Error message is displayed during registration if postcode is not found. Also during checkout this check is made. Postcode check for new/existing shipping address added. When customer selects existing address, for that also we postcode check is made. When customer adds new shipping address at checkout, postcode check is also made during that time. Auto fill up of postcode as customer types postcode. Auto fill postcode helps customer sees the postcode as typing is going on. You start typing postcode, the list will come down with matching postcode. Postcode check through popup when customer visits your store. Many stores are strict with deliveries. They need customer to check postcode early. With popup customer can check delivery as soon as they visit the store. Suppose a location is far and you only want to activate online transfer for postcodes. So you can set payment method based on postcode. Cash on delivery for near by locations. Online Credit / Debit for far away places. Shipping methods can be assigned to postcode. Set shipping methods based on postcode. Flat rate or fedex for other customers. Custom message like delivery availabe. City, State and Zone name. Check previous updates & version in Documentaion below. Want to display useful information accross the store.